O'Sheehan's is a dining concept that premiered on Norwegian Epic. It is like the Blue Lagoon restaurants on some of the earlier Norwegian ships in that it offers comfort food on an around-the-clock basis but other than that there is little similarity to earlier Norwegian dining concepts. Named after Norwegian's chief executive, Kevin Sheehan, the concept here is an Irish bar and grill. However, it is more like those found in New York or Boston than those in Dublin. Indeed, the heavy dark wood bar and furnishings would fit perfectly in the 19th century Irish bars that you still find in Manhattan. Adding to the American flavor are the bowling lanes and pool tables that are on the outskirts of this large venue. Thus, O'Sheehan's is not only a bar and a dining venue but an entertainment area as well. The food section of the menu that you find sandwiched between the bottles of ketchup, mustard and malt vinegar on each table is divided into two parts. There is the breakfast part, which is served from the early hours of the morning until late in the morning. Then, there is the part of the menu listing the offerings that are served throughout the rest of the day. The breakfast menu consist of familiar morning favorites - - eggs, bacon, sausage etc. The thick French toast was soft and tasty. And the scrambled eggs were the best that I had on the ship - - tasty and freshly prepared. The other section of the menu begins with bar food appetizers such as spicy chicken wings and fried mozzarella sticks. The buffalo wings were not particularly spicy but the chicken was tender and tasty. The mainstay of the entrees is the O'Sheehan's burger. It comes on a bun with a slice of American cheese and strips of bacon. Accompanying it is a large quantity of french fries. It is a respectable burger. Before selecting one of the entrees on the printed menu, check the chalkboard near the kitchen for the daily special. It is often a comfort food from the British Isles that make an interesting diversion from the ordinary. 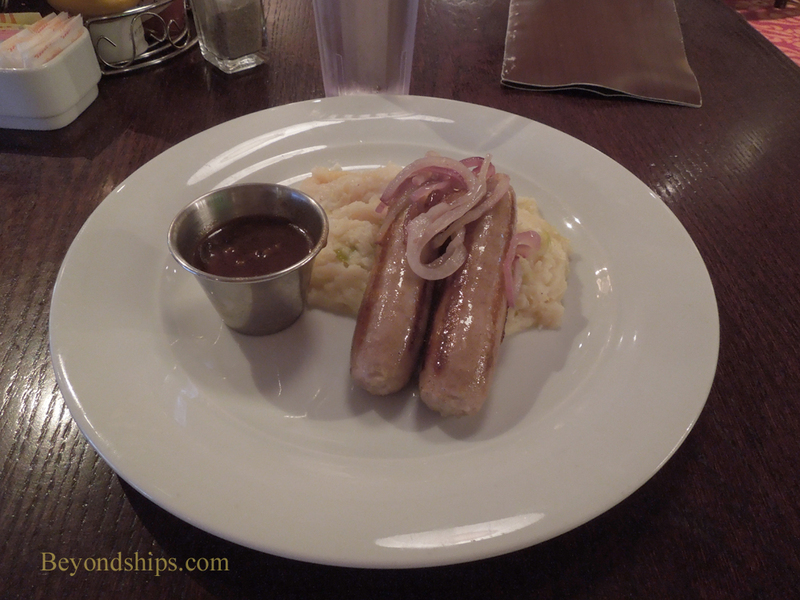 Bangers and Mash (sausages and mashed potato) and Shepard's Pie (ground lamb and vegetables covered by a layer of mashed potato) were both very good. This restaurant does offer a healthy dining option but you do have to look for it. On the dessert menu mixed in with the brownie sundae, apple pie and strawberry pound cake is a fruit plate. It includes grapes, fresh water melon, c antelope, honey dew melon, yogurt and a large piece of tasty banana bread. 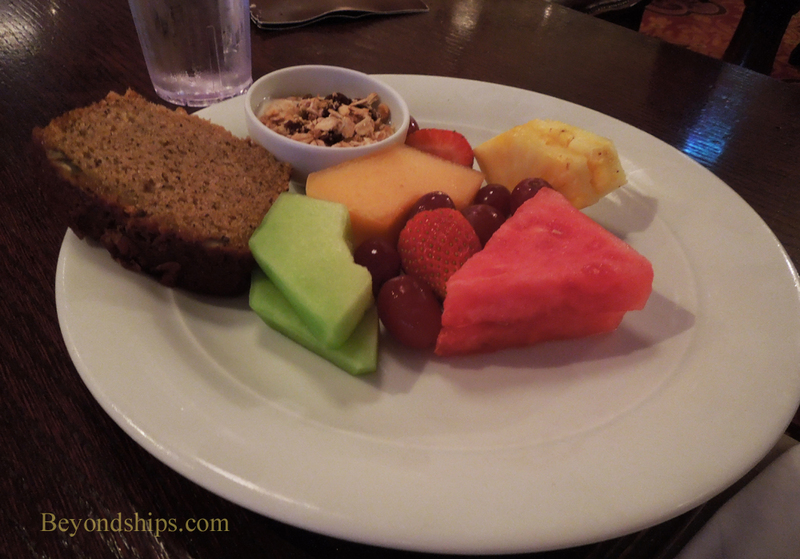 No ordinary fruit plate, this one could easily be a light meal in itself. O'Sheehan's is not a gourmet venue. It is for those times when you want straight forward comfort food. The atmosphere is relaxing, the location in the heart of the public area of Deck 6 is convenient and the hours are unbeatable. There is no cover charge for this restaurant. Above: French toast and scrambled eggs. 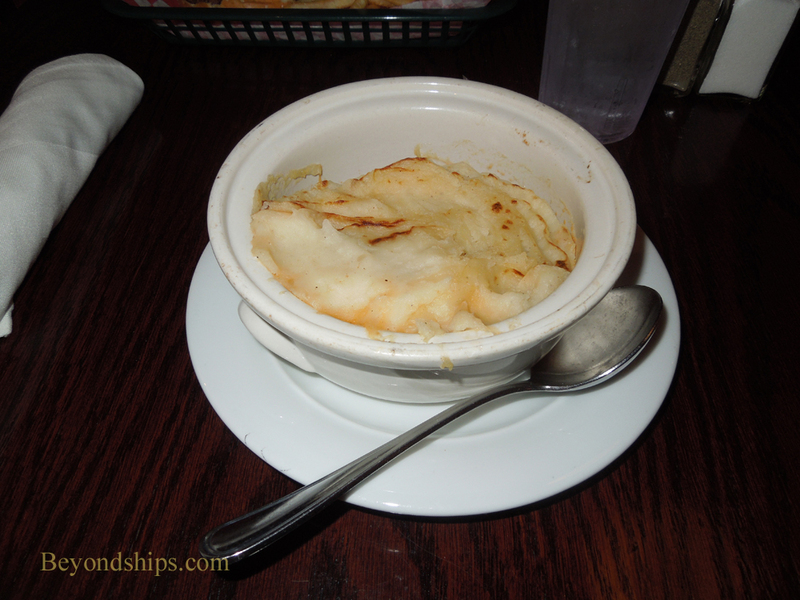 Comfort food from the British Isles: shepard's pie (above) and bangers and mash (below). Below: The fabulous fruit plate.